Hmmm. I am being patient. Ok, kind of patient. There is a deadline for this project. And I always meet my deadlines. So cross your fingers, please. Anytime you are starting a renovation project, it’s a good idea to put together some inspiration. I am a Pinterest nut which means I have Pinterest boards for every possible room I may renovate, every home I may remodel or build and then some. I have created inspiration boards of photos for every room in the Waco house. So today I am going to share what I have in mind for the remodel. 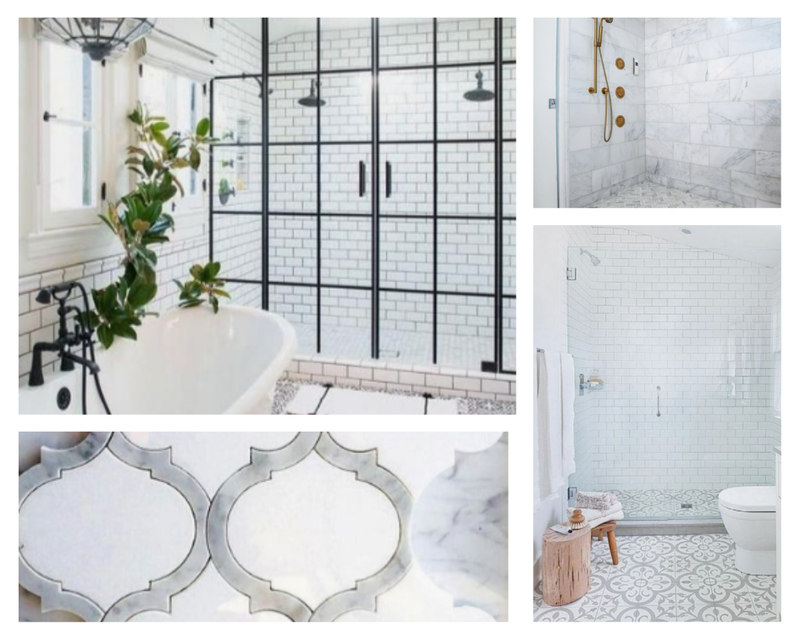 *Disclosure – Just because I have photos of gorgeous bathrooms doesn’t mean that’s what I will be able to use in the remodel. This is a smaller home, with a low budget that we are remodeling to use as a short term rental. And the budget is low, so I have to be creative. 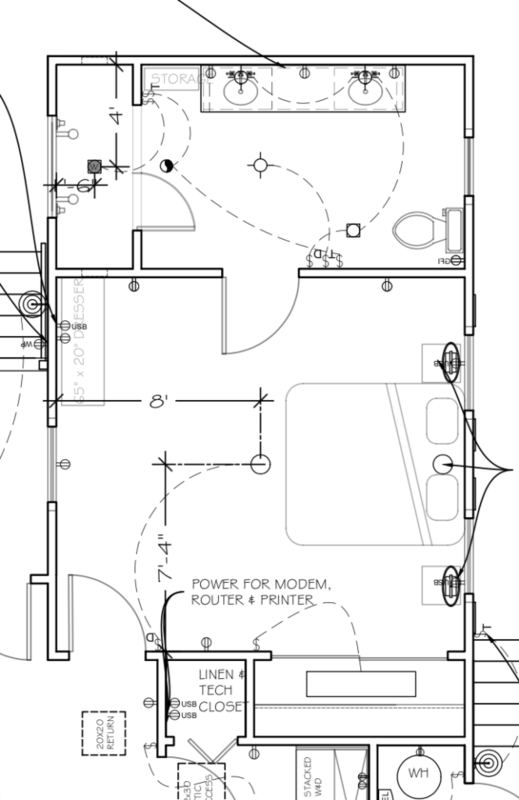 Before I share my inspiration ideas, let’s look at the plans for the master bath. It’s not fancy. It has a large shower on the left, double vanity on the back wall and toilet on the right. There is room for some vintage storage pieces, which will be really fun to shop for in Texas. 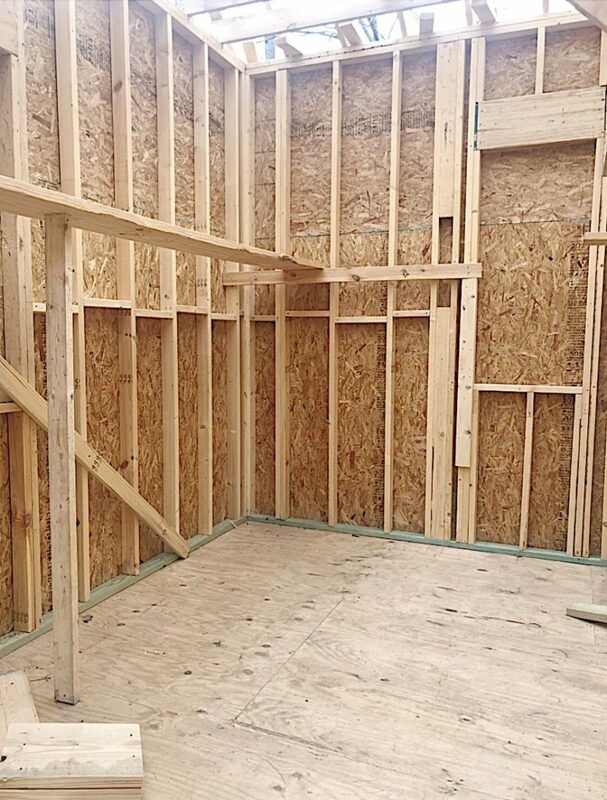 Here is how the master bathroom fits in with the master bedroom. In the master bathroom, I want to use tile on the floor, shower floor, and shower walls. There are two different looks that I have in mind. 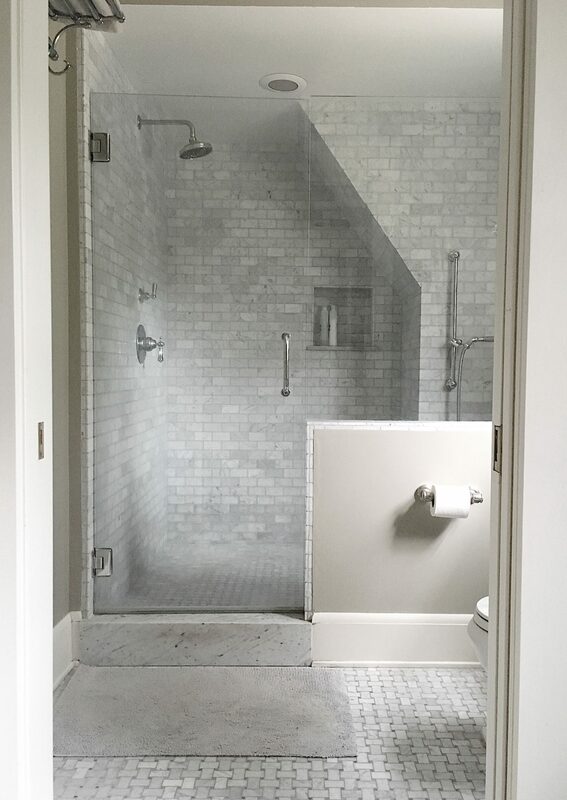 The first one is a black metal shower door with white tile and dark grey grout. The second look that I love is similar to what we have in our home in California. It’s the white and grey marble with clear glass shower doors. These are some of the photos I have collected on Pinterest. 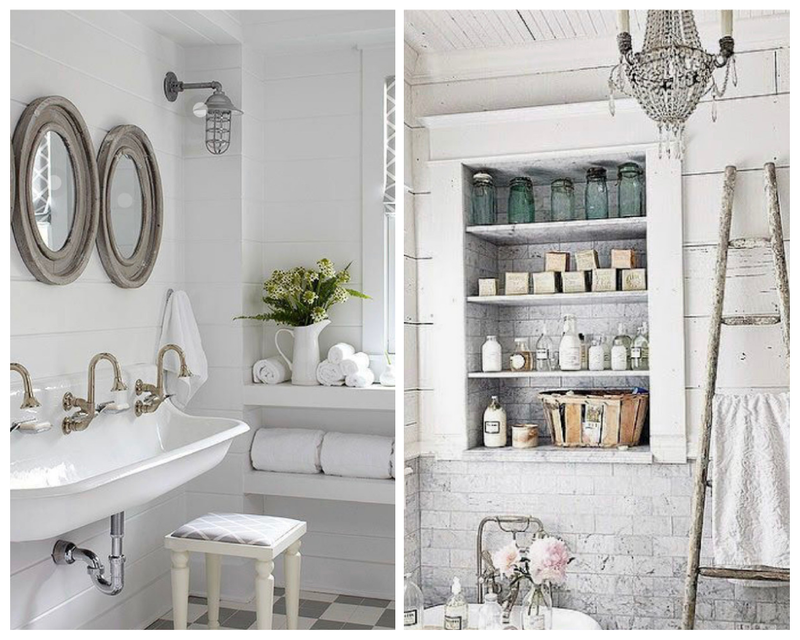 The house is also over one hundred years old and is farmhouse style so I love these bathrooms too. I love the trough sink but I think I will use it in the other bathroom. I think the master bath needs more of a cabinet with a double sink. Some of you may be surprised that occasionally I do select function over fashion. I love marble tile. 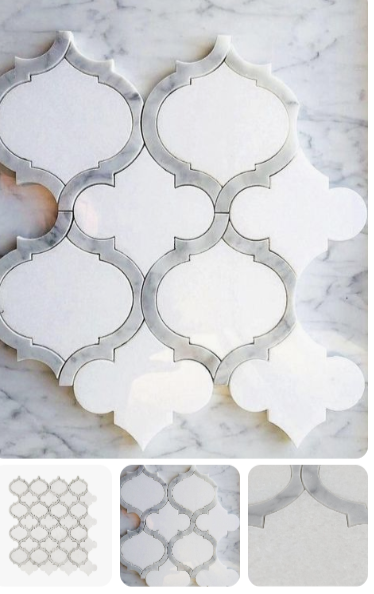 This tile has been on my Pinterest Board forever. I used it at a friend’s house a few years ago. I am so excited to work with Jeffrey Court to select my tile! This is the shower in the master bathroom of our California home. I love the simple design of the marble subway tile. Maybe I should do something like this? I know I have some decisions to make. But it would be really great if you can help me. I would love your input, advice and any suggestions you have! Just leave your ideas in the comments below. I have to make some decisions in a few days! Whatever you choose, I’m sure it’ll look great. Especially tge trough sink in the main bathroom. On something that needs to last for hopefully at least 10 years (bathroom design), I’d do something that’s not too trendy. And I’d def keep to the farmhouse asthetic. And put the storage space in there with the double vanity. Super good idea, leave the cutesy sink for another bathroom, preferably a guest half bath so storage isn’t really a biggie. Just my thoughts. Love the black metal doors. Plan on using them in my design for my Tiny house build. You can never go wrong with classic design. It always stands the test of time so it never goes out of date for the future. I absolutely love the design change. I love the farm style sink but I agree with you, I’d put in another bathroom. 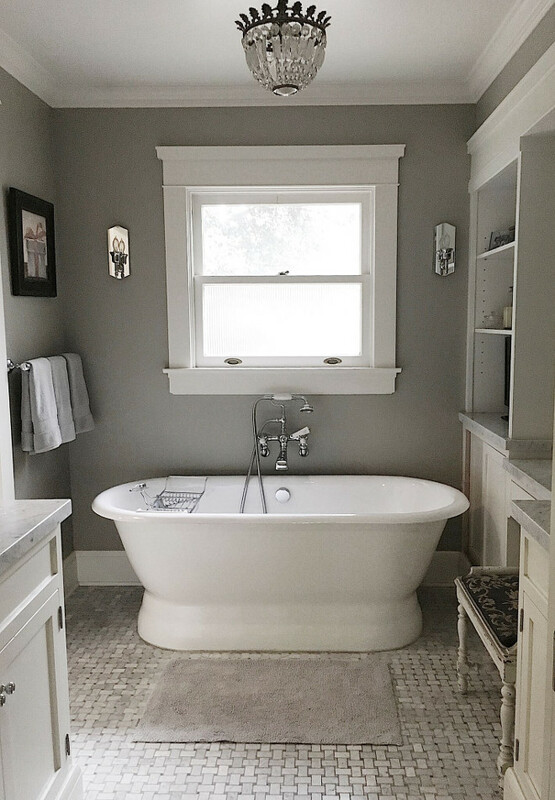 I think most people are looking for counter space in the master bath. Perhaps a guest half bath that isn’t used everyday for makeup, shaving, etc. Storage and counter space doesn’t matter as much and it would be in a place where guests would say “WOW!” Love, love, love the marble tile. I love the farmhouse look. One thing I would include is if you plan on staying there at any time in Waco is to have a locked storage area just for yourselves; just an idea in case you plan to stay there part of the time enjoy the process! I love the softer look of the grey and white! Can’t wait to see how the house comes together. Really like the black doors and the subway tiles. Those doors are a great wow statement. I like the simple subway tile the best. Remember, this is a rental house (at least for now). And the idea about a locking cabinet for your personal items is a good idea as well. I worry about the all glass shower doors with renters. Will they be able to be kept clean? My two cents not having a clue what anything costs, but I LOVE that marble tile. I think if you were to go with that, it just lends itself more to glam farmhouse, and I don’t see anything wrong with that for a master. My personal master and bath is sort of a french country farmhouse, and the rest of my home isn’t that style. All that being said, this is a short term rental. You won’t be living there, so in this case I would tend to let my budget decide. Even in my own home, when I went to pick granite. I didn’t want to be overwhelmed so I told them off the bat not to show me the least expensive they had and don’t show me the most wxpensive. That narrowed my choices for me. Those black shower doors pop out at me everytime I look at the pictures. If they are harder to clean go with the glass doors though. I think the simple, more subtle subway tile for master shower room is the way to go too, love the woven look tile on shower floor & bathroom. floor. 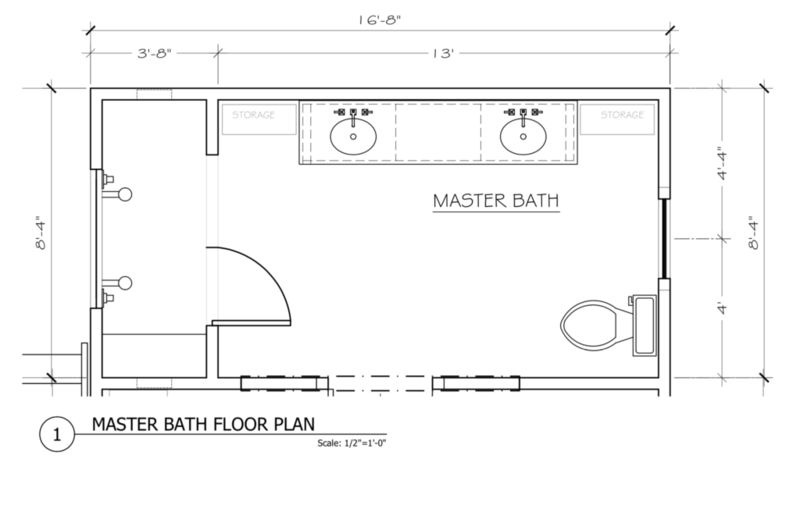 Agree with moving farm sink to another guest bathroom also…. I vote for whichever has less grout! You aren’t going to be there every week to clean the bathrooms and chances are good no one is going to clean the bathrooms as thoroughly as you would. So do whatever is the easiest to maintain and longest lasting in a rental. Just a suggestion. I absolutely love the first pic top left! Those showers doors are to die for! I also love that marble tile you featured from your friends page to go with that! My thoughts: The black shower doors are terrific and a bold statement. I’m not sure if I’d worry about them being ‘trendy’ if I really like the look. The black faucet really works beautifully with it. However, if you want to keep things very neutral, maybe the more calming look is the way to go (the grey). The trough sink: I agree, not for the master. It’s a whole different mood/style than the master will be. The farmhouse look: I think this is the look that will be expected, so the decision is whether to stay with that expected look, or to go with something ‘different’ to add interest and that WOW factor. Maybe combine the farmhouse look WITH some of the ‘different’ decor subtly here and there. Whatever you decide, I have no doubt that it will be THE PLACE to stay in Waco!!! Have fun! !